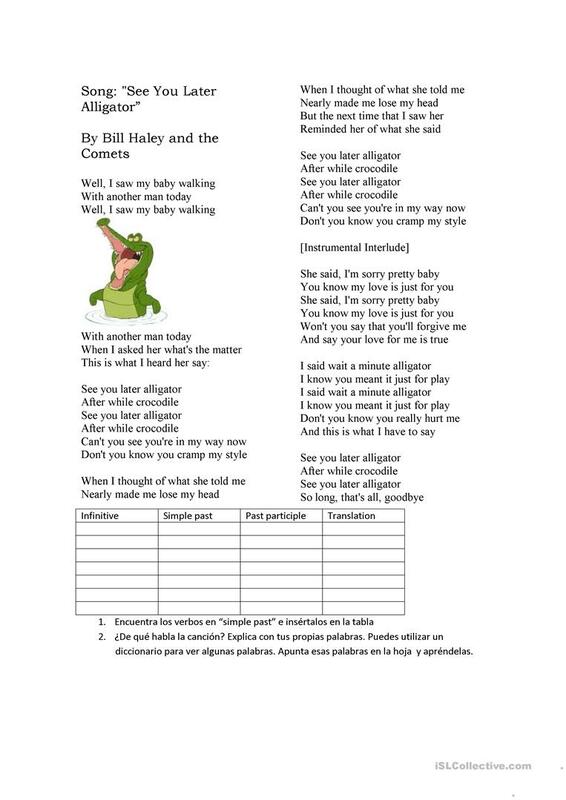 Worksheet to be done with Bill Haley and the Comets´"See you later alligator". The students will find the verbs in simple past and add them to the chart. They will also try to understand the lyrics with the help of a dictionary. The instructions are in spanish, you can easiily change them. The above downloadable worksheet is a great resource for high school students, elementary school students and adults at Elementary (A1) and Pre-intermediate (A2) level. It is aimed at practising Past simple & continuous tense in English, and is useful for improving your class' Listening, Spelling, Reading and Writing skills. Kreeta is from/lives in Spain and has been a member of iSLCollective since 2011-04-03 20:57:20. Kreeta last logged in on 2019-04-10 08:52:18, and has shared 3 resources on iSLCollective so far.